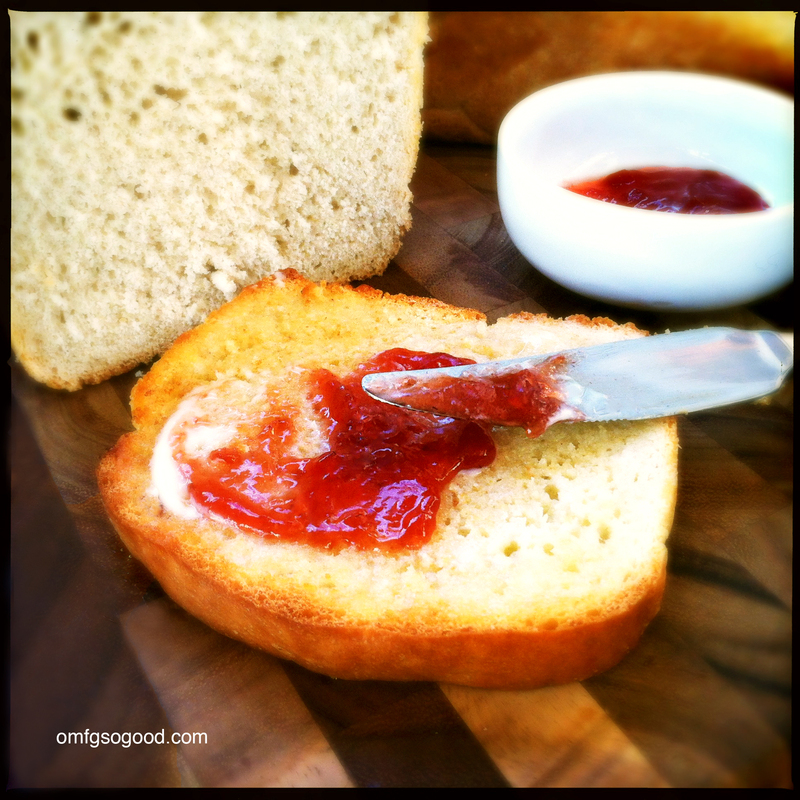 english muffin bread | omfg. so good. 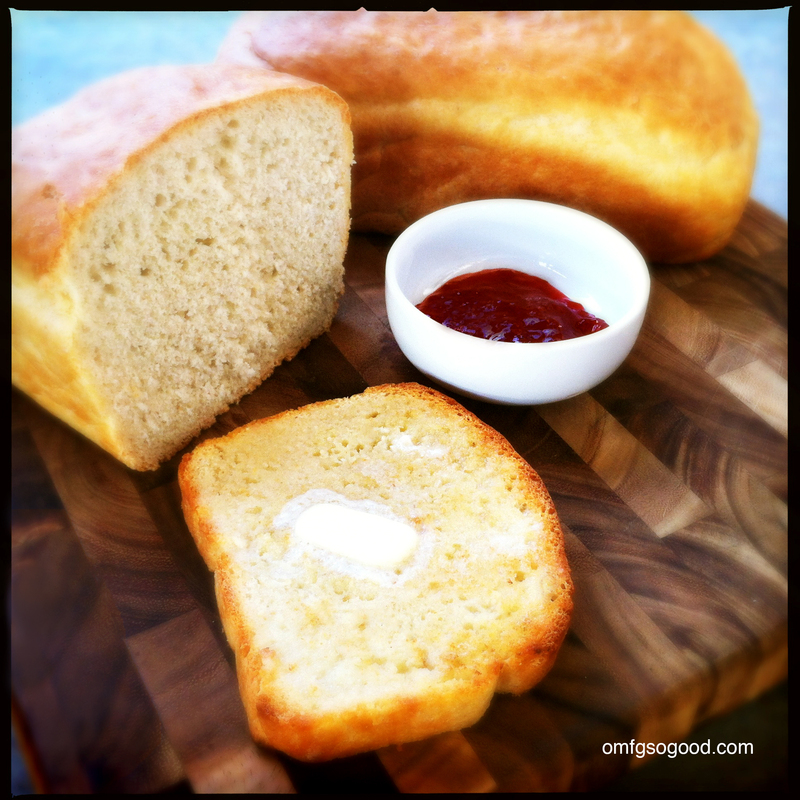 My dad has been making this deliciously fattening, perfectly toasting, english muffin bread for years. I don’t even know where he got the original recipe. Honestly, I don’t care where he got it. I just care that he continues to make it and share it with me when I visit. He’s tried for a LONG time to convince me that it’s simple enough to make for myself. Little does he know, I just like seeing him in front of the mixer doing his funny little happy dance, whistling old Van Morrison tunes. He’s my all time favorite. Well, him and this bread. Toasted, with lots of butter and crunchy peanut butter. The bread, not my dad. Preheat the oven to 350 degrees. Grease two loaf pans with butter and set aside. Pour the warm water in the bowl of a stand mixer fitted with the dough hook. In a medium mixing bowl, whisk together the yeast, salt, sugar and bread flour. Add the dry ingredients to the warm water and mix on low speed until well combined and sticky (around 10 minutes). Cover the mixing bowl with a kitchen towel and let it rise until doubled in size. Remove the dough and divide into two equal portions, place in the prepared loaf pans and shape to fit then cover with the towel and allow to rise until the dough reaches the top edge of the pans. This bread makes the best toast. The butter melts into all the little nooks and crannies (totally stole that from Thomas’) and the texture is spot on to a good old fashioned english muffin. And since this recipe makes two loaves, you’ll have enough to make around five grilled cheese with tomato and bacon sandwiches. My mom eats an English muffin for breakfast every day! But hers are store-bought, and they definitely don’t come with a cute little mixer-happy-dance. Pingback: baked orange rum french toast | omfg. so good. Pingback: bananas foster french toast | omfg. so good.